Submitted 2 years 7 months ago by feeds user. This clever tool is an invaluable little gadget that fits in your wallet and weighs next to nothing! When matches and lighters fail you, this nifty tool will become invaluable to help you start a fire when you need it most. 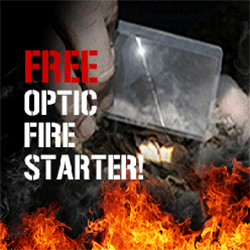 PLEASE NOTE: The bearer of Optic Fire Starter accepts all responsibility for it's use or misuse.